James Fisher combines the strengths of technical anthropology, literary memoir, and striking photography in this telling study of rapid social change in Himalayan Nepal. The author first visited the Sherpas of Nepal when he accompanied Sir Edmund Hilary on the Himalayan Schoolhouse Expedition of 1964. Returning to the Everest region several times during the 1970s and 1980s, he discovered that the construction of the schools had far less impact than one of the by-products of their building: a short-take-off-and-landing airstrip. By reducing the time it took to travel between Kathmandu and the Everest region from a hike of several days to a 45-minute flight, the airstrip made a rapid increase in tourism possible. 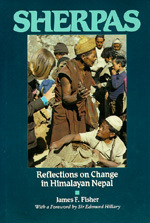 Beginning with his impressions of Sherpa society in pre-tourist days, Fisher traces the trajectory of contemporary Sherpa society reeling under the impact of modern education and mass tourism, and assesses the Sherpa's concerns for their future and how they believe these problems should be and eventually will be resolved. James F. Fisher is Professor of Anthropology at Carleton College and the author of Trans-Himalayan Traders: Economy, Society, and Culture in Northwest Nepal (California, 1986).